1. Soil Structure Interaction under Dynamic Loads. Effects of an irregular soil profile on site amplification (J. Dominguez, R. Abascal). Earthquake response of nonlinear building-foundation systems (E. Bazan, J. Bielak). Dam-foundation interaction under spatially correlated random ground motion (M. Novak, E. Suen). Recursive evaluation of interaction forces of unbounded soil in frequency domain (S.K. Mohasseb, J.P. Wolf). Anti-plane dynamic foundation: soil-foundation interaction for incident plane SH waves (Z. Xinchuan). Estimation of natural frequency and damping factor for dynamic soil structure interaction systems (F. Miura, K. Toki). Soil-structure interface effects on dynamic interaction analysis of reinforced concrete lifelines (Y. Chen, T. Krauthammer). Effect of interactions on dynamic active earth pressures (M. Kawamura et al.). Soil-structure interaction response to high amplitude forced vibration (D.K. Vaughan). Dynamic behavior of the soil-foundation interaction system due to earthquake type loading (K. Baba). BEM analysis of 3-D soil-structural foundation interaction for incident body waves (H. Takemiya, K. Goda). 2. Vibrations of Machine Foundations. Vibration isolation of structures from surface waves in homogeneous and nonhomogeneous soils (K.L. Leung et al.). State-of-the-art in analysis and design of machine foundations (M. Novak). Effect of confining pressure on shear modulus of cemented sand (T.S.Chang, R.D. Woods). Investigation of large diesel engine foundation vibration (P.J. Bosscher). Dynamic behavior of grouted sand (N. Li, R.D. Woods). Time effects on shear modulus of unsaturated cohesionless soils (S.M. Wu, R.D. Woods). Experimental study on vibration of machine foundations (D. Zhang et al.). Determination of foundation vibration by in-situ model test (R.J. Yan). 3. Base Isolation in Earthquake Engineering. Seismic isolation of the existing city and county building in Salt Lake City - a case study (E. Elsesser, M. Walters). Advances in base isolation in China (Lee Li). The acceptance of base isolation for earthquake protection of buildings. The Foothill Communities Law and Justice Center - a case study (A.G. Tarics). Optimization of the mechanical properties of the base isolation layers for aseismic design (L. Hadjikov, P. Dineva). Studies on aseismic isolation device for electric substation equipment (H. Suzuki et al.). Study on a base isolation system (I. Nagashima et al.). Despite advances in the field of geotechnical earthquake engineering, earthquakes continue to cause loss of life and property in one part of the world or another. The Third International Conference on Soil Dynamics and Earthquake Engineering, Princeton University, Princeton, New Jersey, USA, 22nd to 24th June 1987, provided an opportunity for participants from all over the world to share their expertise to enhance the role of mechanics and other disciplines as they relate to earthquake engineering. The edited proceedings of the conference are published in four volumes. This volume covers: Soil Structure Interaction under Dynamic Loads, Vibration of Machine Foundations, and Base Isolation in Earthquake Engineering. 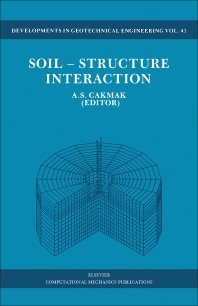 With its companion volumes, it is hoped that it will contribute to the further development of techniques, methods and innovative approaches in soil dynamics and earthquake engineering.